Our early upbringing has a profound effect on our lives, shaping our self–image, attitudes, moods and behaviour. We develop survival strategies and ways of being as a result of this conditioning. When our negative behaviours don’t produce the love we want and need, we can blame not only ourselves but also others. The Hoffman Process teaches us how to release and resolve the persistent negative feelings of being unloved and unlovable. We examine the major influences on our lives, trace the root of the adopted negativity, and release the pain, grief, anger, shame and resentment that has been stored there for years. 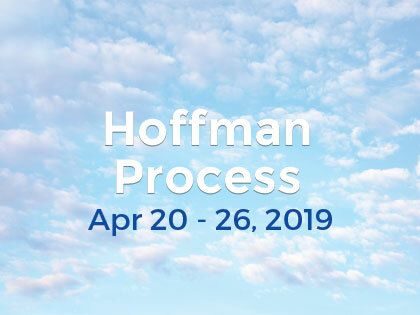 Whether you choose to do the Hoffman Process as a rite of passage, a journey of self-discovery or a way of laying to rest the ghosts of your childhood, there is no doubt you will experience a future different from your past. The Process provides a safe and supportive environment in which you can first confront and experience your childhood pain, resentment and anger, and then progress to fuller understanding, compassion and forgiveness. The Hoffman Process uses a unique combination of proven techniques, including guided visualization, journaling and expressive (cathartic) work. During the intensive 6 ½ day residential course, you are led through a carefully structured sequence of powerful experiences that enable you to discover, isolate, and resolve negative conditioning and recover your natural self-confidence and self-esteem. All children want love and attention from their parents. Children believe implicitly that mother and father know what they are doing at all times. For a child, imitating a parent’s behaviors, moods and attitudes — literally becoming like them often seems the only way to earn a parent’s love and attention. When a child takes on his or her parents’ negativities in an attempt to be loveable by the parents, he or she becomes a victim of the Negative Love Syndrome. None of us were immune to the Negative Love Syndrome. Its only product is inauthentic, compulsive, self-sabotaging behavior. The Negative Love Syndrome puts us at war with ourselves and others. It also disconnects us from our own true source of power, our inner spiritual selves, which may appear only in rare moments or short flashes of insight. Bob Hoffman discovered this overall dynamic and called it the Negative Love Syndrome. He also learned how to unleash the power of the Spiritual Self so we can heal ourselves. To learn more about Bob’s work, the theoretical underpinnings of the Hoffman Process, and whether or not this work is right for you, please read The Negative Love Syndrome and the Quadrinity Model© A Path to Personal Freedom and Love by Bob Hoffman.